Welcome to Midland Gardens! As one of the most popular apartment complexes in Bronxville it has become a top choice for buyers. Midland Gardens is a unique complex in the Village of Bronxville with an in-residence superintendent staff and office secretary. Covering five acres of land, the property is beautifully landscaped. With flowers, open spaces of grass it has plenty of room for residents to feel like they are in an oasis. One that is far away from the busy streets of Manhattan. Because people looking to purchase an apartment may not know the great sense of community among the residents, we would like to share some intimate features. For instance there is an annual September Festival on the property where the building caters food and a special performance. Residents can invite friends and family to to enjoy this festival. It is a beautiful event that takes place each year! Another fun fact about Midland Gardens is the on-site vegetable and fruit garden. Everyone joins together to take care and maintain the garden. They can go as many times a week as they desire they can go and pick their own veggies for dinner. There is also play area with swings and slides for children of all ages to enjoy. Midland Gardens, which consists of four buildings each with 2-3 separate entrances, was built and designed by Kenneth B. Norton in 1939. Mr Norton also designed the Carlton House and the John Murray House. Midland Gardens has become known as a premier residence in Bronxville, featuring beautiful interiors and exteriors like its landscape. There has been complete upgrades of electrical, cable and internet services to each apartment. 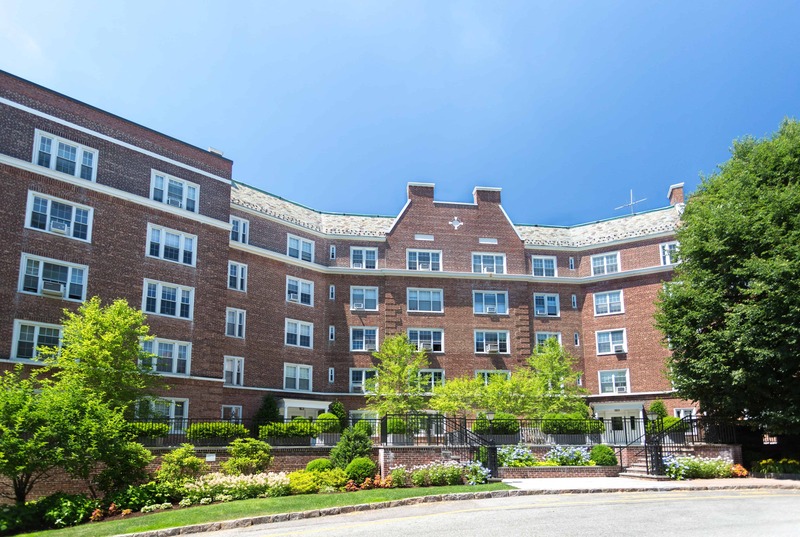 Because of its proximity to shopping in the Village of Bronxville and Metro North it is the perfect apartment complex for those who like to walk. And for those who would in Manhattan. Designers: Midland Gardens features interiors by award winning interior designer, Eric Cohler of Eric Cohler Design. Mr Cohler is the author of “Cohler on Design” recipient of the Elevate Award in 2016 for his book interior design. Mr. Cohler ‘s work included the complete renovation of 9 lobby entries and 45 floors. Maureen Hackett, of Hackett Designs, designed the exterior property and landscape. Ms Hackett has been recognized and awarded for many projects in the New York Metropolitan and has been a guest speaker at the New York Botanical Gardens. Which makes it easy to see why the grounds at Midland Gardens is one of its finest features. If anyone has any questions about Midland Gardens please contact Barhite and Holzinger at 914-337-1312 or sales@barhiteandholzinger.com.